city – I’ve been strolling the streets and falling in love. machinery and connections to win the office. vote for someone who gets goose bumps too. and judging by the conversations I was eavesdropping on, I wasn’t the only one. for me, but they have never tasted this good. Usually I just make them at home. jalapenos blended with olive oil (www.tacodeli.com). I’ll worry about that tomorrow. Shiner Bock ice cream?!!! Be still my fatty little Texas heart! And migas…Mmmm. A staple on almost every breakfast menu in the part of the world. Some places even offer red, green or both. YOU ARE MAKING ME MISS HOME!!!! Did you get to Amy’s? She and I went to grad school together! Sigh, swoon. I dream about Las Manitas’ refried beans…I’m glad you were able to try them. We never got the Shiner Bock ice cream, Renee. But Las Manitas also had red and green chilaquiles — another thing I crave. It was bean heaven, Melting Wok! 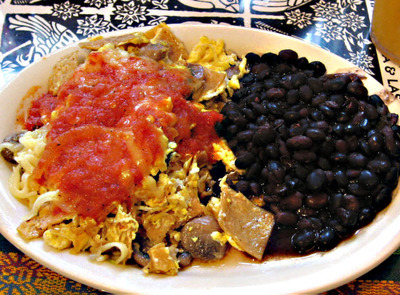 Matt, your post on migas was one of my favorite food blog posts. Never got to Amy’s, Alanna. Small world, huh? Now I am dreaming of those refried beans too, Lisa. How about figuring out how to recreate them for your book??? I’m amazed I didn’t see you walk into the Roaring Fork as I work right across the way in a nice little high rise. Other great Austin treats are Moonshine and South Congress Cafe. Sorry I did not know you were going to Austin – one of our faves is Maria’s Taco Express on South Lamar – truly a legend and great migas. And if you ever get back, check out HEB’s Central Market (there are two) – second only to the capitol for tourism – awesome markets. and Lisa (Homesick Texan) would you send me your e-mail – got some questions. Sorry I didn’t know you were there, Gin — I’d have waved! Larry, wish we’d had those recs, though truthfully we had so little time I’d just have felt bad for missing more good things. NExt Time! And thanks for the migas recipe! If you go to Lisa’s site I think you can contact her that way. Cheers! so sorry that i didn’t keep up with my blog reading… i’d have known you were in austin! it’s just a hop, skip & a jump from me. so did you get to try the shiner bock ice cream? it’s amazing… austin is truly a magical place, isn’t it? glad you fell in love! OK… have you MOVED to Austin? If so, I understand. It is a good place. But don’t people eat and take photos there too?